Dubai, the City of Gold, is known throughout the world for its modern innovations. This city is a living testament to man’s great ability to bring life to what the mind can conceive. But alongside the impressive progress Dubai has shown the world in the last 50 years, it has also managed to preserve its cultural heritage and traditions. 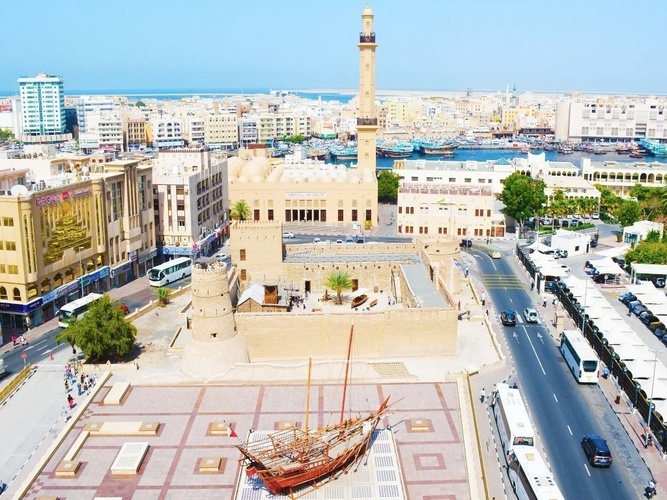 So if you are a tourist who is more fascinated by the humble but colorful roots of a city, you will surely delight in what Bur Dubai has to offer. Are you coming to Dubai for the first time and you have no clue where to begin your discovery adventure? Get ready – after you’ve rested and recharged at Arabian Courtyard Hotel & Spa luxury rooms, it’s time to go exploring. Listed below are destinations that boast of the city’s historic allure which you should visit. This is a must for anybody who wants to easily access the city’s traditional side. Bastakiya Quarter boasts of stunning old buildings that showcase impressive architecture and an ingenious ventilation system. This is a protected site that welcomes tourists all year round. Apart from its historical buildings, Bastakiya Quarter also has art galleries along its maze-like alleys. These galleries display masterpieces from different parts of the globe. There’s also a popular teahouse that both locals and tourists frequent. The Dubai Creek is considered one of the main origin points of Dubai’s economic growth. Along this important body of water is the stretch called Marsa Al Seef, which is more popularly known nowadays as Al Seef. This 1.8-kilometer stretch is the best place to experience old and new Dubai. For something old at Al Seef, you’ll be treated to the maritime heritage of the city, particularly its fishing and pearl diving industry. Walking tours are conducted here every day and you can visit the open-air museum that showcases the fishing equipment and vessels used for the humble industry. Now, for something new – there’s an abundance of recently constructed modern buildings and recreations of traditional buildings. The “recreated” buildings look exactly like authentic structures of old, but they actually house modern businesses, such as an international ice cream house. It’s a nice little surprise for people exploring the area. This is considered one of the best places to visit for people who wish to understand Dubai’s unique customs and traditions. The centre offers an educational tour that includes a variety of activities that demonstrate the Emirati way of life. You can also sample authentic Emirati meals, which are actually savory and quite healthy. Here you will find the magnificent Dubai Museum, but the fort is a marvel in itself. It holds great significance to the history of Dubai as it served as the home of the ruling family, as well as, the seat of government, garrison and prison. As for the Dubai Museum, it features a vast variety of displays – from traditional boats to dioramas depicting the Bedouin desert life and the pearl fishing industry, along with archaeological finds from centuries-old graves. It’s easy to include the fort in your itinerary because it’s in close proximity to most of the popular accommodations in Dubai, such as the Arabian Courtyard Hotel & Spa which is right across the Dubai Museum. A Dubai experience is definitely incomplete without shopping, and there’s no better place to shop for products that have been sold in the city since the early times than Deira. Everything from gold jewelry, to exotic spice blends, to perfumes and textile can be found here. Deira is located along the northern bank of Dubai Creek so it is easy to include in a day of exploring many of the city’s historic destinations. When you come to Deira, you can join a tour guided by locals. Being part of the tour will allow you to sample select products. What’s more, the tour guide can protect you from aggressive merchants. Visit the home of Iranian pearl merchant, Sheikh Ahmed bin Dalmouk, which is known all over Dubai as the Heritage House. It was built in 1890 and it was beautifully restored as a tourist destination. This architectural gem provides visitors a glimpse into the lifestyle of Dubai’s early wealthy settlers. Explore the wonders of the desert by joining a desert safari tour. For an authentic travel experience, opt for a camel ride that will take you to your final destination – the Heritage Dinner Safari. Enjoy the outdoor dining experience that will treat you to both local and international fare. Not only that, henna art is provided to guests as well. And while having your fill, there are Arabic dance performances for your entertainment. You can make arrangements to join a desert safari tour with the help of your hotel. Luxury hotels in Bur Dubai have a concierge and travel desk that assists guests in arranging excursions, including the desert safari tour. There clearly is no shortage of activities for first-time visitors who want to delve deep into Dubai’s culture. So, for your own trip, be sure to take the destinations enumerated here into consideration. All these offer a glimpse into the beginnings of the city. After seeing all of them, you’ll surely marvel more at how far Dubai has come.